This week I received a relatively mint condition Roland MSQ-100 in the mail that I purchased off Ebay. Usually I have great success with Ebay, but this time around I realized why the seller was off loading his MSQ-100. It is plagued with the dreaded Roland MSQ-100 “HALF” Measure Issue. Once you get that message, it’s good luck getting rid of it. In addition, it pretty much renders the Roland MSQ-100 to a giant brick “retro” paper weight because it’s useless thereafter. Info on this error message is pretty scarce on the web. I have managed to find a couple of bits and pieces of info but nothing concrete as to how to fix the problem. There is no reset procedure for the MSQ-100. If you power off for more than a day with the adapter unplugged it “should” erase the memory, but for some reason it doesn’t. Currently I’m attempting to try and flood the memory with sync data to see if that might work and will report my results later. This worked for one individual but I’m not sure the details. I also don’t have any .wav tape data to test with and load, but I’ve heard that doesn’t really work. In fact, the HALF measure message prevents me from even using the TAPE function on the MSQ-100. There is an erase measure function which I’ll detail here, but this doesn’t work either. Here is the Roland MSQ-100 Service Manual that I found for those interested. I noticed that several people have this issue with the Roland MSQ-100. There has been no standard solution found to solve the problem yet. One person actually punched buttons a hundred times and powered their unit on and off several times which miraculously solved the issue. Their confidence in the MSQ-100 was forever shot though. Another spoke of possible dry joint issues which I’m not sure about. Others have experimented with TAPE data and Sync data flooding of the MSQ-100 to jolt or cause a memory full reset. 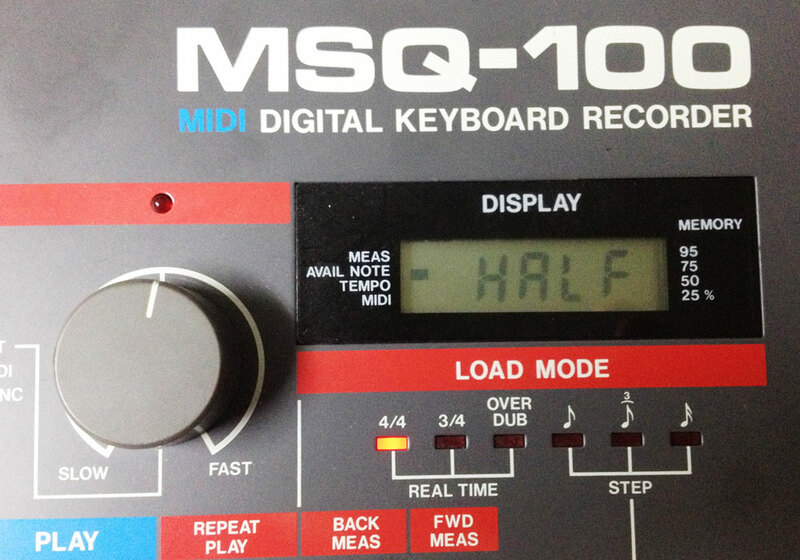 I’d warn any potential buyers of the Roland MSQ-100 that like most other vintage hardware, the HALF measure syndrome appears to be a known achilles heel. Roland didn’t think to create a RESET procedure for the MSQ-100. On a plus note, beside a nice looking retro paper weight, one could pull the colored buttons to be used with the Roland Juno-60 or Juno-6 if you need replacement buttons. In the end here, I decided to keep the MSQ-100 and tinker with it a bit to see if I can get it working. It’s such a clean and nifty looking unit sitting on top of my Roland Juno-106. I also got it at a very reasonable price even though I feel a bit ripped that the seller didn’t mention the HALF measure issue. I know for a fact it existed before I received the device so it was a cheap shot by the seller. Nonetheless, that happens now and then on Ebay and if anything it presents a nice topic to share on my blog which seems to help a few others from time to time in solving their issues with vintage gear. As always, I’ll update this article with news and solutions if any are found with solving the riddle of the mysterious Roland MSQ-100 HALF MEASURE issue. UDPATE: I believe I have FIXED and found the problem to the HALF MEASURE issue. Read the comments below for UPDATE #3 for more info. It appears the 3-way toggle switch is likely to blame for things getting stuck. I recently picked up a used Roland MV-30. It’s in excellent condition and supposedly a very good vintage sequencer with lots of unique features. One big problem though is that in order to use the Roland MV-30, like the Roland S-50 or W-30, it requires an OS Boot Disk. Unfortunately this disk did not come with the Roland MV-30. So I’ve been spending the day scouring the web trying to find a download image to create a floppy OS boot disk. So far no luck, but hopefully soon I’ll find one. If someone out there does happen to use or have a Roland MV-30 and could spare a moment to send me an image of the OS via email, I’d greatly appreciate it. I’d even compensate you for it as well. Some people are selling the OS Boot disk online but they are charging $30-50 for shipping to Japan which is insane. So I’m a bit stuck. There is also a Yahoo Group for the Roland MV-30, but like many nowadays it looks abandoned and not accepting new members. 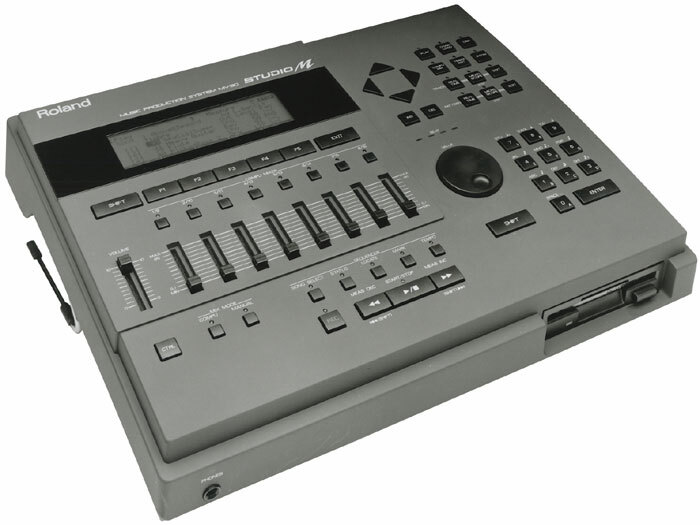 Once I acquire a working boot disk, I’ll write a follow-up on my initial impressions of the Roland MV-30 Sequencer. Thank you! This is the latest OS version for the Roland MV-30 MStudio Sequencer but I’ll take any version I can get. UPDATE: I now have two Roland MV-30 OS Boot disks posted below. Both I think are the same, but are from different sources. Is there a difference between V1.0 and V1.09.1? I’m not sure. THANK YOU to all the individuals who contributed the images for the Roland MV-30. Hopefully these images will help others.